Description: Another shot while parked waiting on a morning delivery. Description: CN SD75I in New Jersey on a northbound River Line freight. Description: Pulling up Shoreham Hill. Description: Trailing on the WC today. Description: The transfer is waiting for CP 372 to clear the loop before it heads into Northtown Yard. Description: Two 75I's wait for the Loop. Title: CN 149 by Paris Jct. Description: Rounding the curve, with the glint of morning light shining off the sides of the units, CN 149 with CN 5713 - CN 2250 and 142 cars (long count) heads west towards Chicago. Description: CN 149 with CN 5713 - CN 2250 and 142 cars (long count) approaching Woodstock on it's way towards Chicago. Description: Train #118 split just north of JO on the Superior Subdivision for a set-out of cars on the Hiawatha Yard just west of the crossing on the Valley Subdivision. Center Ave, 1446 hours. Description: Train #118 split just north of JO on the Superior Subdivision for a set-out of cars on the Hiawatha Yard just west of the crossing on the Valley Subdivision. Backing down to the Valley Subdivision. From U.S. Route 10, 1503 hours. 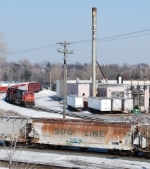 Description: Returning to the Superior Subdivision from setting out cars in Hiawatha Yard on the Valley Subdivision at JO Crossing. Center Ave, 1523 hours. Description: Backing up against the train down the Superior Subdivision at JO Crossing. Center Ave, 1529 hours. Description: Train #188 continues southbound towards Stevens Point on the Superior Subdivision at JO Crossing after setting out cars in Hiawatha Yard on the Valley Subdivision. From U.S. Route 10, 1545 hours. Description: At the still in use crossing guard tower on Broadway, 1145 hours. Description: I've been wanting to an westbound at this spot for years, and it has finally paid off. Here CN 5713 is seen leading L517 as it comes into town. 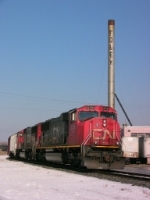 Title: CN 5713 east at Ingersoll. Description: 120 is over 5 hours late as they pull down the transfer track in the freshly fallen snow.